There are some fun astronomical events ahead of us on the calendar, and with a little preparation you can catch them all from home. On Friday, July 27, there is going to be a blood moon, or a lunar eclipse, though not all eclipses make the moon appear red. According to Forbes, the special effect is caused by the indirect light from the sun bouncing through the Earth’s atmosphere and scattering the longer blue and violet wavelengths. All that’s left is that ominous red and orange color. 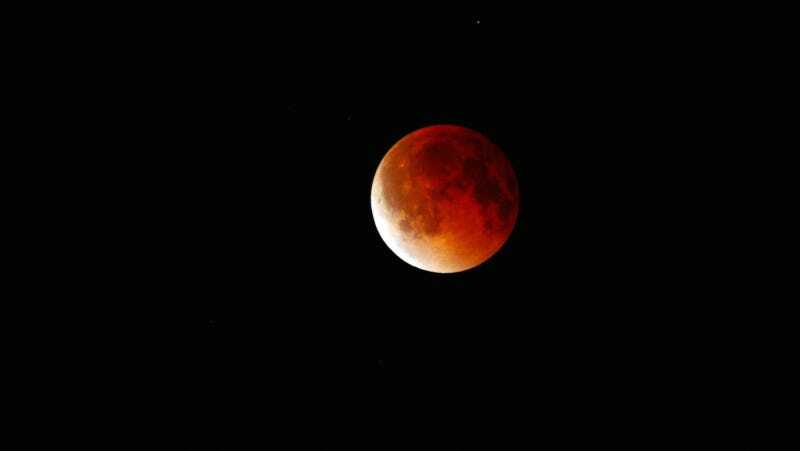 This event is also the longest lunar eclipse of the century, lasting one hour and 43 minutes. It’s rare for an eclipse of this nature to take place in July—the perfect month to sit out in a field at night and stare at the sky. Here’s how to take advantage of the opportunity. The good news is that you don’t need a telescope or special glasses to witness this eclipse. The bad news is that you still have to be in the right part of Earth to see it. Folks in Australia, Asia, Africa, South America and Europe are in the right quadrants. North Americans are going to be missing out. For those with prime moon-watching real estate, if the sky is clear, you should be able to find it pretty easily and enjoy. To figure out the best time in your area, use Timeanddate.com. They have several helpful pages for tracking moon events, and can tell you when it’s time to turn off the TV and go to the window. If your area is in the wrong place, cloudy, or you just hate bugs, you can watch the blood moon on your computer screen. CNET reports that the Virtual Telescope Project is setting up in Roman Forum on the Palatine Hill in Rome for the rest of us to enjoy. They’ve already started their countdown on YouTube, where you have the option of setting a reminder to come in and watch. As a bonus, Mars is in opposition to the Sun, meaning it is on the opposite side of the Earth from our live-giving star. That means it’ll appear brighter and closer than usual, and we’’ll have two glowing red orbs starring down at us. If only I was in the right country to get freaked out by the heavens’ bloody gaze. Scientists have created a high-resolution image of a fruit fly brain that will let researchers trace the connections of neurons throughout the brain. A team at the Howard Hughes Medical Institute’s Janelia Research Campus led the work, which was recently published in Cell. Davi Bock, the lead researcher on the project, said in a statement that this level of resolution hasn’t been achieved before and it will allow scientists to better understand which neurons play a role in behaviors exhibited by fruit flies. Though a fly brain is relatively small — about the size of a poppy seed — creating a detailed map of the 100,000 neurons it holds is still a major challenge, and traditional methods haven’t allowed for this type of imaging to be done. The researchers developed a new set of tools that included high-speed cameras, custom-built systems that can quickly process brain tissue samples and a robotic loader that can pick up samples and put them into place on its own. Doing so required dozens of scientists, engineers and software developers and years of work. But with the new system and two electron microscopes, the team was able to take 21 million images of 7,062 brain slices and stitch them together into one complete image. And the result is a full, detailed look at the brain of an adult fruit fly, one that has already led to some surprising findings about how fruit fly brains work, including a new cell type. “Any time you look at images with higher resolution and more completeness, you’re going to discover new things,” Bock said in a statement. The team has made its dataset available to other scientists and it could help researchers better understand how behaviors like learning, courtship, memory and flight are driven by the brain. The Howard Hughes Medical Institute says more than 20 lab groups are already using the data. “It adds another tool to the toolkit we’re using to understand this animal,” said Bock. Whole-Brain Electron Microscopy Volume from HHMI NEWS on Vimeo. No need to panic, folks! Just Russian hackers claiming “hundreds of victims” to infiltrate U.S. electric utilities, giving them the ability to cause blackouts. The state-sponsored hackers used fairly common tactics to compromise the vendors that supplied those utilities, according to U.S. Department of Homeland Security (DHS) officials who talked to the Wall Street Journal. They then stole credentials from those corporations to gain access to the utilities. The hackers belonged to a “shadowy” group previously called Dragonfly or Energetic Bear, which is believed to be sponsored by the Russian government. So, how serious was it? “They got to the point where they could have thrown switches,” said a DHS official. Fantastic. Even worse, the attacks are believed to be ongoing, and some victims still might have no idea they were the victims of a cyberattack. In case you forgot, Russian hackers attacked Ukraine’s power grid in 2015 and caused nearly a quarter-million people to lose power. It only lasted a couple of hours, but it also might not have been a full-scale cyberattack — meaning Russia could have just been testing the waters. DHS officials warned the U.S. electric grid was being targeted by Russian hackers as far back as 2014, but had previously only reported dozens of victims. Now it says there have been hundreds. After their cordial meeting last week, maybe Donald Trump can politely ask Vladimir Putin if Russia was responsible for these attacks, the likes of which could be used one day to paralyze American cities and the U.S. economy.